Project development continues into 2018 with the fitting of these heavier tracked bogies and motors - 270 series fitted here - with 540 motors being readied for some serious grunt to see just how steep an incline such a rig could handle..
WHEEL CARRIERS - The axles for 2018 have a swivel pivot to increase traction over undulating beaches. Two motors are bolted to the wheel carriers along with a pair of idlers. These are the mid-range torque motor units that well be experimenting with to see what angle slope the AmphiMax can handle if the hill is made of different materials. We'll be trying to simulate shingle and sandy beaches at angles up to 30 degrees where 15 degrees would be considered steep for most beaches in the UK. For the really serious work carrying SeaVax in and out of the water, we'll most likely switch to the large 540 motors and the extreme gearboxes with 6mm output shafts. Copyright photographs © Cleaner Ocean Foundation Ltd 18 June 2018. AmphiMax is a 'low budget' portable boatyard and launch and recovery vehicle all in one. It is also a navigable amphibious vehicle, meaning that it can follow, or even advance relocate, to rendezvous with any SeaVax fleet. The AmphiMax is also a production jig, specifically designed for the rapid assembly of SeaVax hull components - so that the separately manufactured sub-assemblies line up accurately ready for joining. This agricultural/aquacultural service vehicle will allow the Foundation to build and launch SeaVax fishing and ocean conditioning vessels cost effectively anywhere in the world, doing away with the need for a shipyard and the high overheads that entails. Being amphibious an AmphiMax can present a low profile if anchored semi-submerged offshore to remain unobtrusive in nature sensitive areas, should that be a concern. In most cases that is not an issue. NEW ZEALAND - A bulldozer and trailer launch and recovery rig at Ngawi Beach in New Zealand. AmphiMax takes this technology to the next level. Any boat of a moderate size may be launched and recovered more efficiently. This includes lifeboats and standby oil spill vessels, hydrographic and oceanographic survey vessels. AmphiMax takes up less beach space and is neater. In cases where ships run aground, AmphiMax may have sufficient pushing power to re-launch a stranded vessel. The AmphiMax is not just a launch and recovery machine, it is an essential development tool for Seavax and a long term commitment to ocean monitoring for those operating SeaVax systems around the world. We can think of no quicker way to take a boat out of the ocean into a dry dock situation to allow engineers to fit alternative heads for experimenting full size. Not only that, but the AmphiMax carries all of the equipment to allow engineers to get on with the job without having to wait for a turn, or scratch about trying to find tools. Welding and lifting would be some of the functions that the AmphiMax allows for just about anywhere it is beached. AMPHIMAX - The AutoCAD drawing above shows the layout of the full size SeaVax boat launcher that can carry up to 48 tons (96 tons AUW) with 8 bogies and 60 tons with 10 bogies (120 tons AUW). This dual purpose leviathan is thought to be the largest amphibious vehicle on the drawing board anywhere in the world as a serious project. The chassis is approximately 19 x 32m (61 x 104 feet) and would be powered by 4 or 5 diesel engines depending on the number of axles. For the space frame designs we are using off-the-shelf hollow sections. The cost of the raw materials for this design is around £17,000 + VAT and delivery. This does not include welding or cutting equipment costs, but a design along these lines is promising. Using this method the weight of the bare full size (44m SeaVax) chassis has fallen from 11 to 7 tons. This frame can offer over 140 tons of buoyancy in the sea. This can be reduced to negative buoyancy during launching and recovery by deflating buoyancy bags. 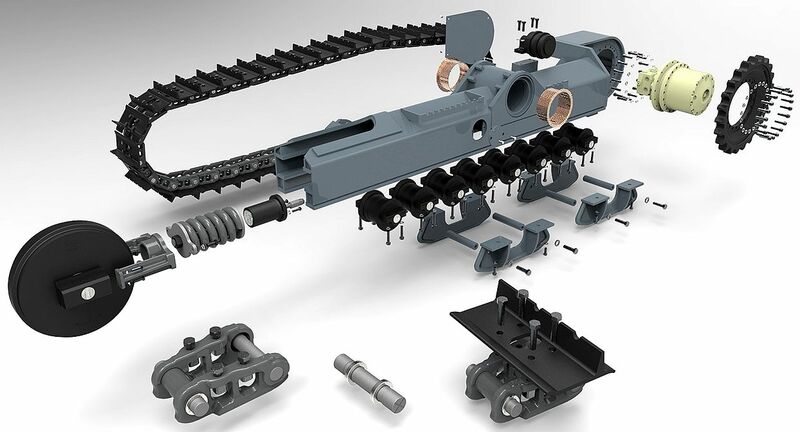 AXLES - A number of companies specialize in producing tracked undercarriages of various weights and for different applications, such as those seen above on the famous Alibaba website. Eight 12 ton capacity units are likely to weight 3,500kg each for a total of 28,000kg or 61,712lbs (27 tons). The steel for the chassis and cab are likely to be around 15 tons and the engines and hoses at least another 5 tons. Hence, the AmphiMax is sure to weigh at least 47 tons, leaving 45 tons load carrying capacity to launch a SeaVax. AMPHIMAX FISHING BOAT SUPPORT VEHICLE - This AutoCAD drawing shows the layout of the half size boat launcher that can carry up to 20 tons with 4 bogies and 34 tons with 6 bogies. This amphibious vehicle is designed to launch RiverVax size filtration vessels from any suitably sloping beach on any shore in the world. The chassis is approximately 10 x 20.5m (33 x 67 feet) and would be powered by 2 or 3 diesel engines depending on the number of axles. Shown above is a 4 axle chassis. Most hydraulic pumps powerful enough to power the wheel-motors, conveniently, have four outputs. We would then need two pumps like the Poclain PL4H10 or equivalent, that can deliver up to 33,750 litres/minute (L/M) into four outputs. The combined torque without a reduction gearbox would be 430,000Nm (43,847 kg/m or 43.8 tons/m of leverage), more than enough to climb a 20-30% slope - indeed, enough to climb almost vertically if traction were not an issue - ignoring percentage efficiency losses in the bearings, tracks and hydraulic drives that could absorb 20% or more in adverse conditions. EXAMPLE - Using 8 x Poclain MS25 wheel-motors (with planetary reduction) aiming for 20 rpm per wheel motor (4.35 mph) we'd need a total fluid flow of 19,568 L/M. Two PL4H10 pumps can deliver 67,500 L/M - over three times the flow required. The power handling capacity is also well within range @ 137kW per pump unit, giving us around 510kW capacity when we only need around 150kW in theory. It might though be worth keeping the additional engine power for a greater reserve - and better hill climbing ability - even offering a tractor mode. The diagram above shows two 140kW (188hp) engines in blue, with two oil reservoirs in green. The pressure flow circuit is shown in red and the control valves are blue. AMPHIMAX 34 TON BEACH LAUNCHER - In this drawing we can see what the smaller chassis looks like with 6 axles when loaded with a SeaVax coastal fishing boat. The amphibious launcher is also a portable dockyard for economical: recovery, servicing and repairs to our ocean cleaning boats. AmphiMax launchers could overcome many operational difficulties for the fishing industry on a global basis, cutting fuel bills and saving time on docking or beaching over conventional methods, where those methods are applicable. The term 'fishing' includes for selective filtration of plastic from seawater. Locally, fishermen are blessed with marinas at Brighton, Newhaven and Eastbourne. Hastings fishermen use rollers (short logs, greased planks and pipes) to launch fishing boats from the beach and cable winches to recover them. Hence, locally AmphiMax is unlikely to be useful for the fishing industry, especially where catches are restricted for conservation purposes. In addition, the cost of £200,000+ would not be viable for launch and recovery purposes only. When used as a jig and portable development tool, that is where the savings mount up. The AmphiMax floating dockyard may visit any location to provide a mobile boat repair service, where the mechanics and hull cleaners visit you, rather than having to wait your turn for hauling out and scraping, etc. At the moment this is only in theory, but our team are working on producing the first full size prototype for launch off the south coat of England. Modular construction means that we could in theory build any size launch vehicle. We are aiming at a 96 ton all up weight machine for the final SeaVax blue water cleaner, and for our smaller SeaVax coastal prototype (or RiverVax version), a 48 ton all up weight machine. That equates to launch/recovery capacities of 20, 34 and 48 tons. BEACH LAUNCHING SEQUENCE - Here we see a SeaVax 30 ton filtration boat piggy-backed on an AmphiMax boat launcher as it trundles down a 7 degree beach (10% gradient 1/10) in relation to sea-level, into the sea to begin operations. Anything more than a 11 degree beach (20% gradient 1/20) and traction becomes an issue that only caterpillar tracks may tackle. AmphiMax could not climb a 22 degree beach (40% gradient). We doubt if anything could without a lot of difficulty. A 31 degree beach = a 60% slope. See Ice Cold in Alex; a WWII film where they hand crank a truck up a steep sand dune. The steepest roads in the world are Baldwin Street in Dunedin, New Zealand and Canton Avenue in Pittsburgh, Pennsylvania. The Guinness World Record lists Baldwin Street as the steepest street in the world, with a 35% grade (19°) overall and disputed 38% grade (21°) at its steepest section. The Pittsburgh Department of Engineering and Construction recorded a grade of 37% (20°) for Canton Avenue. The AutoCAD drawings of AmphiMax and SeaVax on this page are Copyright © 26 May 2018 Cleaner Ocean Foundation Ltd and Bluebird Marine Systems Ltd. All rights reserved. SUBMERGED AMPHIBIAN - SeaVax floats off the partially submerged AmphiMax portable dockyard. The launcher can be parked in this position for recovery later in the day, while a crew board the SeaVax. Or, the AmphiMax can be driven back up the beach to await a recovery command. The AutoCAD drawings of AmphiMax and SeaVax on this page are Copyright © 26 May 2018 Cleaner Ocean Foundation Ltd and Bluebird Marine Systems Ltd. All rights reserved. FLOATING BOATYARD - The AmphiMax is seen here floating on the surface, having blown its ballast tank. This amphibious vehicle can be navigated to other beach locations to provide a portable boat servicing solution. This vehicle uses 12 standard frames and six 12 ton caterpillar tracked axles. The AutoCAD drawings of AmphiMax and SeaVax on this page are Copyright © 26 May 2018 Cleaner Ocean Foundation Ltd and Bluebird Marine Systems Ltd. All rights reserved. Modular construction means that we can mix and match from the basic components to produce a launch and recovery solution to meet the specifications of SeaVax and RiverVax ocean research vessels. We anticipate being able to produce our bare-frame prototype AmphiMax amphibian for around £187,000 pounds, using volunteers, free-issue parts, materials & storage, and other support from local authorities. The full size AmphiMax will cost proportionally more. Please note that these are not commercial prices, but are in connection with ocean cleaning by way of a social project that is not for profit, or indeed, less than cost basis. Additional cost will come in the form of onboard equipment that will be needed to assemble and service SeaVax, RiverVax and other machines. It may be an advantage to include navigation instruments for longer coastal and cross channel journeys, security and solar power to keep any onboard electrical equipment supplied with energy. ACCESS - The old drive was not strong enough to carry the AmphiMax frames, leaving us the unenviable task of repairing the drive. We could not take the chance that our repairs might not be strong enough, so we used reinforced concrete. Here you can see the shuttering before a concrete pour. Copyright photographs 11 May 2018 © Cleaner Ocean Foundation Ltd. All rights reserved except for education use and media review. BATCH COMPLETE - In the picture you can see the concrete tamped and bull-nosed. Now all we need is 12 hours without rain - and 24 hours to elapse to strike the shuttering ready for the next section to be shuttered. This section was relatively flat and the same height as the broken slabs that were removed. Copyright photographs 14 May 2018 © Cleaner Ocean Foundation Ltd. All rights reserved except for education use and media review. DUAL CHARGERS - Here you can see us getting to know how our new equipment works. Even at a mild charge rate we will not have to wait long between battery exchanges - meaning we can work for longer when we are onto something. We have two of these programmable chargers and two more 1000 watt beauties for the 25 volt packs. Put that together with the 4 baby chargers at the foot of the page and you can begin to see how the charging banks could have eaten into our lab space - had we not tackled that head on with a couple of shelves to form a Charging Station that should do the trick once fitted. Small things like this really help when it comes to experimenting in water, when let's face it, getting wet does not always keep you in the best frame of mind as your core temperature chills. Good job we have a canteen to retreat to while we recover. In terms of blue growth AmphiMax is an enabling platform in that it makes it cost effective to operate fleets of fishing boats or ocean conditioning vessels on almost any stretch of shoreline, anywhere in the world. In days gone by sheltered harbours and ports were needed for fishermen to operate, except for the few beach launched fleets like those at Hastings in the United Kingdom and Ngawi in New Zealand - where beach launching and recovery has been mechanized and is a curiosity attraction for tourists. Beach launching is a far more cost effective way of operating a fishing boat and can relocate to new fisheries locations without major upheaval - to go where the fish are, not to spend gallons of marine diesel getting to the fishing ground. In terms of sustainability this kind of operation may become more important in years to come. When it comes to oil spills, SeaVax vessels could remain on station at specific hotspots, such as the Gulf of Mexico, Gulf of Guinea (west [ivory] coast of Africa), Australia's Gold Coast or the Mediterranean Sea from Tripoli to Alexandria. OIL SPILLS - Byblos harbour in the Mediterranean Sea was affected by an oil spill. If SeaVax had been developed for plastic fishing and operated in this area at that time, the spill could have been contained by changing heads to filer oil from the seawater. From 2015 to 2016 the project was sponsored by the directors of Bluebird Marine Systems Ltd to the tune of £130,000 pounds. From 2016 to 2017 the project progressed significantly with crowd funding via Avaaz with significantly more backing to push the project on. In February 2017 the Cleaner Oceans Foundation applied for H2020 funding asking for around €1.5m euros over three years to produce a quarter scale working prototype - and in May of 2017 the COF took over management of the SeaVax project. In June 2017 the European Commission advised that the 2017 H2020 application was on a reserved list and that the availability of funds was limited. Bluebird Marines Systems did not find out about the Horizon 2020 call H2020-BG-2016-2017 (see details below) in time to make an application and would not in any event have been eligible as an SME without a trading track record. Hence, there would have been no incentive to apply given the financial risks inherent in being under-funded. 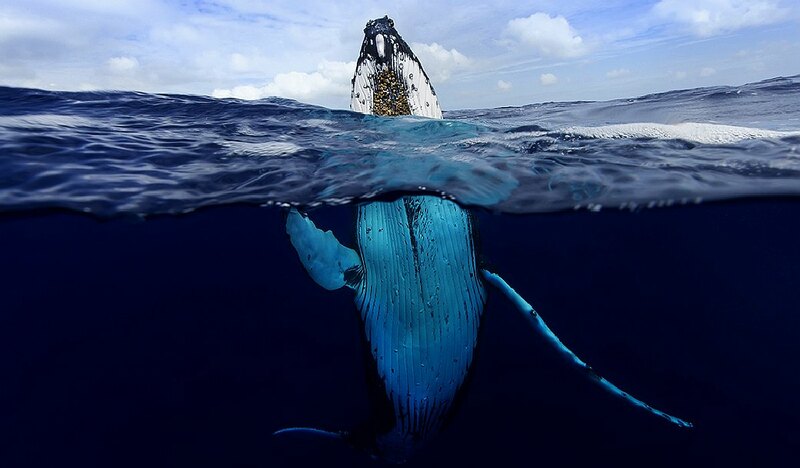 The situation has improved in that with the Cleaner Ocean Foundation leading AmphiMax development, funding incentives may reach a level where such an application could be seen as a reasonable use of resources, provided that funding levels are sufficient to warrant the risk of undertaking such an enterprise. 540 MOTOR & GEARBOX - The output speed from this motor and gearbox combination is 22 RPM. The 6mm output shaft means a bit more machining in our workshops, but we feel that it is worth having a reserve of power for our hill climbing experiments. SHORT GUIDES - These are the first set of roller guides to be tested, the shorter rollers to cope with the rear of the trimaran hull. These soft guides will not be visible to the SeaVax vessel as it approaches the AmphiMax sitting partially submerged on the seabed. Copyright © photograph 26 June 2018 Cleaner Ocean Foundation. All rights reserved. TALL GUIDES - These are the front guides. 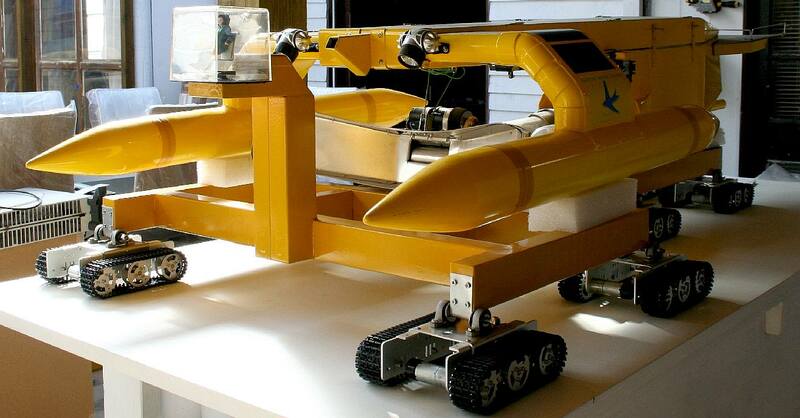 They need to be taller to stand out from the waves and be visible to the human eye and the robot's sensors so that the vessel can aim itself at the AmphiMax - in between the markers - during beach landings, for repeatable couplings during semi-autonomous recovery operations. Copyright © photograph 26 June 2018 Cleaner Ocean Foundation. All rights reserved. At the time of writing (08-1-18) SeaVax has received no government backing or corporate sponsorship. The Cleaner Ocean Foundation needs to raise around $400k dollars for 2018 raise the development momentum above the pace of 2017, and run an ocean awareness campaign. This sum will not pay for SeaVax to be built but it will lay the groundwork in terms of continued development, with the ocean literacy campaign likely to help the project to generate additional funding for 2018. Support for Marine Litter projects was put onto the agendas of the KTN in October 2017, European Maritime Fisheries Fund from November of 2017 and United Nations in December 2017. Putting the potential obstacle of Brexit to one side, it is possible that Government (European) backing could come the rescue in 2018 or 2019. We need to raise at least $3 million dollars to put a full size SeaVax in the water in a moderate timescale. If we had between $ 5-7 five to seven million dollars to rely on for the project this would have the effect of accelerating development with additional part time engineers and additional facilities - and so reduce the time for launch of any prototype. If it were possible to raise $10 ten million dollars or more, then the project could afford to employ full time engineers and other staff and move into top gear. TESTING - The SeaVax is seen here in the part-completed test tank in July of 2016. Since that time the facilities for experiments have been improved to include a new floor to eliminate leaks and a covered passage between the robot laboratory where the development models are made. The photographs of SeaVax on this page are Copyright © Cleaner Ocean Foundation Ltd and Bluebird Marine Systems Ltd. All rights reserved. A diesel engine will be prepared for AmphiMax and the steel frame design developed in readiness for manufacture of the prototype portable dockyard. The search for and negotiations aimed at securing a temporary (or permanent) launch site continue with a specialist IP concern doing the leg and legal work for the project for a fraction of the cost of professional estate agents, solicitors or patent attorneys. COF continues to scout and negotiate for suitable assembly/launch sites where there are some areas in the UK now offering incentives for marine development. Approaches have been made that have so far proved to be uneconomical or impractical. Increasingly business and services are carried out within the marine space. Examples include: offshore terminals, aquaculture, renewable energy, marine biomass, blue tourism, surveying, environmental monitoring, accident response and clean up, and clearing of marine debris and other pollutants. Costs at sea are higher than for equivalent shore based operations and a significant proportion of them are associated with the support vessels which service these activities. Inappropriate vessels can increase costs because they may have limited operational weather windows, high overheads, slow speed, low efficiency and they may be generally ineffective for the task concerned. European yards and their suppliers (often SMEs), are world leaders in high value-added vessels and highly specialised ships. The challenge is to develop novel specialised vessel concepts which are economically viable and environmentally friendly and which will more effectively serve coastal and offshore activities, thereby supporting European growth and employment through development of a blue economy. VERSATILE BOAT SERVICING - It all looks a bit NASA, like their crawler rocket launch delivery vehicle, but ours is much smaller and considerably cheaper. The SeaVax is seen here onboard the AmphiMax proof of concept launch model, before the cradles or swivel axle mounts were fitted. Thanks to generous crowd funding from Avaaz, the SeaVax project now has its own robot lab dedicated to developing the concept. Project development continued into 2018 with the fitting of heavier tracked bogies and motors (see above). This involved the making of eight custom carriages, each with axles that swing to allow the tracks to better fit the contour of uneven beaches. It is hoped that by the end of January 2018, that this development will be nearing a stage when launch test experiments can be designed for our test tank proving ground. These are the old test axles. The Commission considers that proposals requesting a contribution from the EU of up to EUR 7 million for "Specialised vessels for coastal activities" in 2016 and up to EUR 8 million for "Specialised vessels for offshore activities" in 2017 would allow this challenge to be addressed appropriately. Nonetheless, this does not preclude the submission and selection of proposals requesting other amounts. * Develop solutions to at least technology readiness level (TRL) 5 which will significantly impact on the development of a European marine and coastal economy. * Aim to reduce costs by at least 20% compared to current practices taking the entire process including increased productivity and vessel cost into consideration. * Increase the professional skills of workers and the capability of European industry and in particular SMEs within the marine and maritime sectors to develop and commercialise specialised vessels and related technology. OIL SPILLS - The Jiyeh Power Station oil spill is an environmental disaster caused by the release of heavy fuel oil into the eastern Mediterranean after storage tanks at the thermal power station in Jiyeh, Lebanon, 30 km (19 mi) south of Beirut, were bombed by the Israeli Air force on July 14 and July 15, 2006 during the 2006 Israel-Lebanon conflict. The plant's damaged tanks leaked up to 30,000 tonnes of oil into the eastern Mediterranean Sea, A 10 km wide oil slick covered 170 km of coastline, and threatened Turkey and Cyprus. The slick killed fish, threatened the habitat of endangered green sea turtles, and potentially increased the risk of cancer. Although Al Jazeera compared the scale of the oil spill to that of the Exxon Valdez oil spill, later assessment found that the volume spilled was 30 000 tonnes of the higher estimates compared to 42 000 tonnes For Exxon Valdez oil spill. The coastline affected was between 150–170 km, while the Exxon Valdez oil spill affected 2,100 km of coastline.